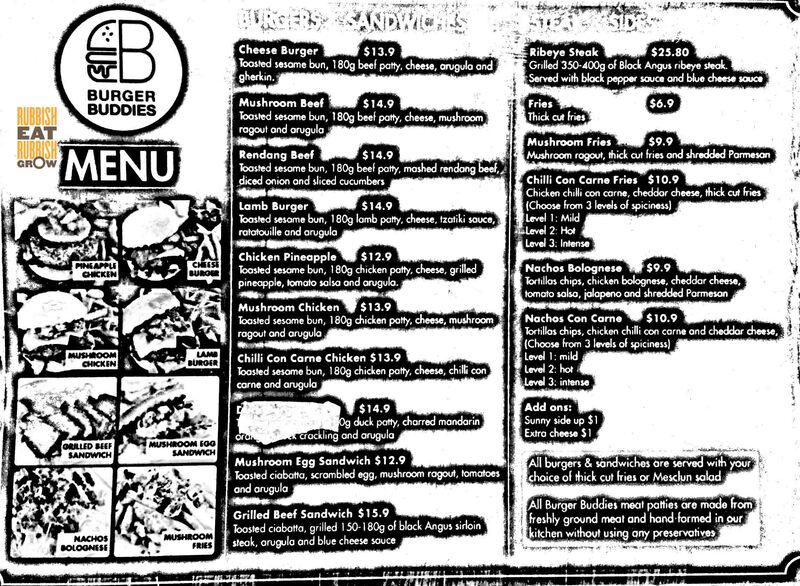 Burger Buddies at Essen @ The Pinnacle, a stall, has been around since at least February 2017. It may sound like a remarkably short time–only one and an half years have past–but in reality it has superseded many burger joints with far more prestigious backgrounds, joints like Meatliquor from London, and The Butchers Club which won a Michelin Bib Gourmand from Hong Kong. The secret to their success is their consistency. I have been to Burger Buddies three times over time, and for all three times, the food is consistently excellent and the ingredients are of good quality. Patties are made from freshly ground meat and hand-formed in their kitchen without any preservatives. All burgers come with a choice of salad or fries, but please go for the fries. They take care in doing the skin-on fries. (Skin-on fries usually mean they cut the potatoes into fries themselves, and not from some frozen fries.) The fries turn out crispy outside and fluffy within—really good fries. They used to have a duck burger but they took it off the menu. Another different-from-elsewhere burger, lamb burger ($14.90), comes with toasted sesame bun, 180g lamb patty, tzatiki sauce, ratatouille and arugula. This is excellent because there is a slight gamy flavour here, which tells you distinctly that you’re eating lamb, but it’s not excessively gamy so it doesn’t come across as revolting. It is also very fat, so juice will drop off your hands. And the tzatiki does what it can to undercut the gaminess and the fattiness. Since the patty is already so fatty, I would suggest that they lessen the butter on the buns. I enjoy it very much. They have some classic burgers on their menu, and grilled beef sandwich ($15.90) is one of them. It comes with toasted ciabatta, grilled black Angus sirloin (150-180g), blue cheese sauce, and arugula. The blue cheese sauce is a surprise since many don’t like blue cheese, but since I do, it adds much flavour to the otherwise bland steak. The steak is done middle-raw, but it is just a steak. Perhaps we have to add salt ourselves. Kudos to sourcing the ciabatta, which is excellent. The last burger I ate from them, Rendang beef ($14.90), comes with 180g beef patty, mashed rendang beef, diced onions and sliced cucumbers. If you have eaten McDonald’s version recently, Burger Buddies’ rendang isn’t as spicy and doesn’t seem to have much depth. But the lightness of the rendang is also pleasant in a way because it doesn’t overpower the flavour of the beef. The sliced cucumbers are really a nice touch to undercut the spice. And the well-buttered buns work very well here, giving it a nice richness. I look forward to eating through every burger on their menu. Note: We pay for our own food and we visit eateries anonymously. In that last photo, the patty looks raw in the middle. It’s a minced beef patty. By most countries’ laws (but not SG? ), all burgers must be cooked through, so as to avoid deadly E.Coli and other bacterial infections. Please tell me I’m wrong, but when I look at that photo, all I see is raw minced beef. Yes they do their beef medium rare which is perfect for me. But if you want yours well done, I’m sure they can do it too. I like a burger that doesn’t pass on killer bacteria. Don’t you, Doctor? Lol. I trust Singapore’s food industry. If it’s other less developed countries, I’ll definitely not eat raw stuff.